Amazing App Features Supported By Research! 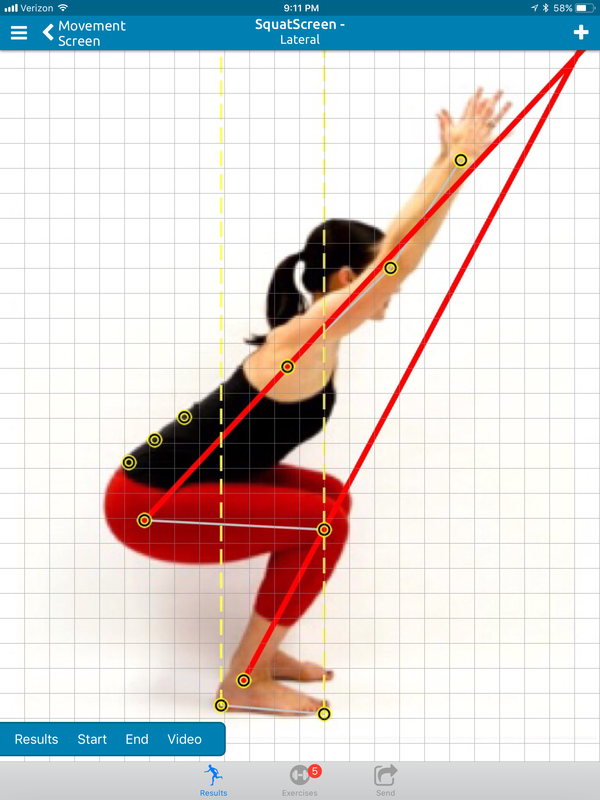 Accurately measure angles and linear distances of posture displacements and documentation for clinical assessments! Create stunning comparative posture assessments in mere seconds! Use QuickScreen for quick express lateral analysis and generate an assessment in less then 10s! Use SitScreen module for accurate and precise seated lateral analysis of your clients to better evaluate work ergonomic environments. 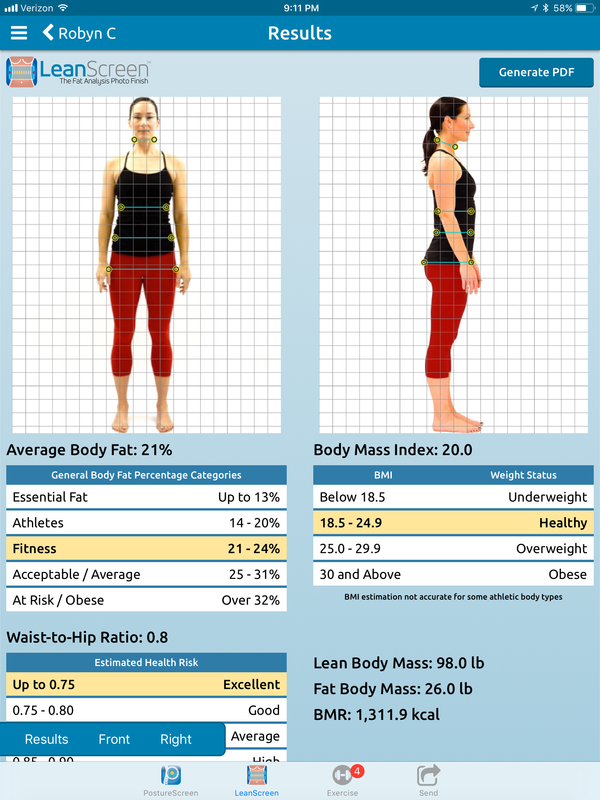 In-App upgrade to LeanScreen 2D and 3D Body Composition Module to allow accurate photographic anthropometric body composition analysis, Waist Hip Ratio calculation, BMI, BMR, Lean Body Mass. Use the easy in-app upgrade module for editing your reports to add personalized customization and branding to match your own business. PostureScreen users with a WebExercises.com account can now access their exercise content and prescribe anywhere and anytime all through the easy to use exercise menu! Using PostureScreen with the Structure Sensor on supported iPads, allows for true 3D full body scanning. Imagine having ability to see a true replica of your client in real 3D, and visualize from any perspective. Easily export 3D models of clients to supported software. This tool is intended to be a quick yet objective postural and movement screening tool in which you can quickly render findings to prospective patients, capture patient demographics, and print or email the prospective patient their findings. Additionally, you can deliver state of the art custom postural and functional exercises to your patient using secure WebExercises (iPhone and iPad Only). It was found that “Assessing static standing posture via PostureScreen Mobile gives repeatable measures for anatomical landmarks that were found to have substantial or almost perfect agreement. Our data also suggest that this technology may also be useful for diagnosing forward head posture.” J Phys Ther Sci. 2016 Dec; 28(12): 3398–3402. In another related study by different authors, it was noted that “The posture mobile application has demonstrated strong rater reliability and preliminary evidence of construct validity. This application may have utility in clinical and research settings.” J Phys Ther Sci. 2018 Jan; 30(1): 31–36. Your investment begins with $39.99USD from iTunes AppStore or $19.99USD from Google Play AppStore. Very small fee via in app purchase modules and for full features ranging in price for examination credits(as low as 15 cents per assessment or unlimited subscription use for up to ten iOS devices for as low as $179USD/year with all assessment modules unlocked). Nothing is as as powerful or inexpensive for professional and objective documentation and client education! See why the PostureScreen Mobile is the most popular and fastest growing posture analysis examination software on the market! **Please note that not all features are avaliable for Android platform at this time for details on both iOS and Android modules and more details on pricing and subscriptions, click here. 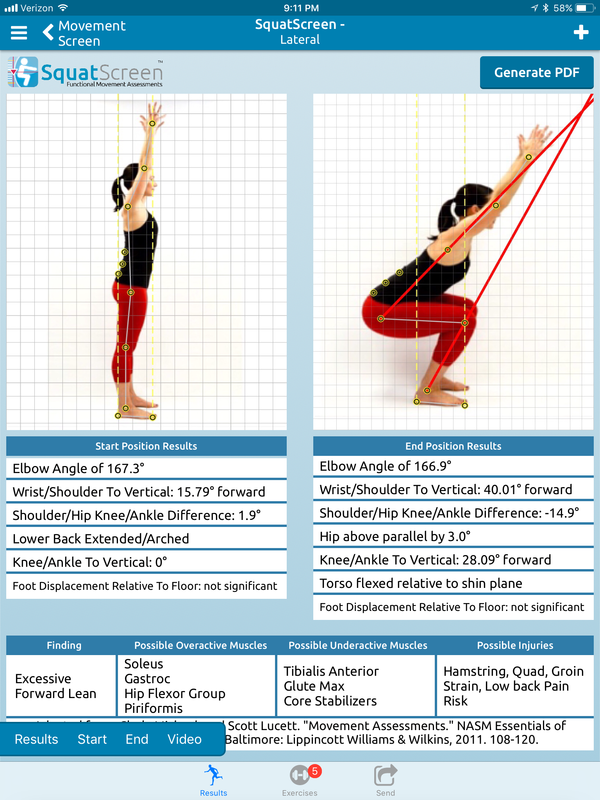 [Conclusion] PSM is a widely available, inexpensive postural screening tool that requires little formal training. 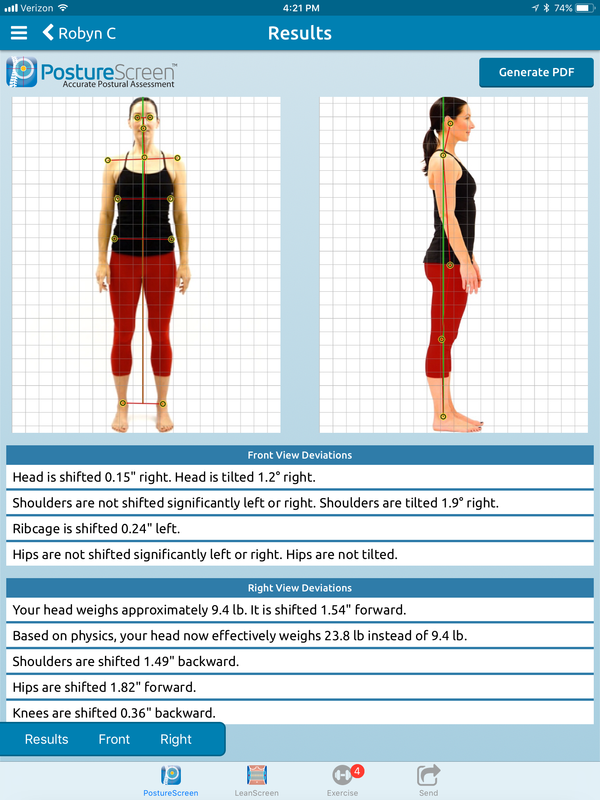 To maximize inter- and intra-rater agreement, postural screening using this mobile application should be conducted with subjects wearing minimal clothing. Assessing static standing posture via PSM gives repeatable measures for anatomical landmarks that were found to have substantial or almost perfect agreement. Our data also suggest that this technology may also be useful for diagnosing forward head posture. J Phys Ther Sci. 2016 Dec; 28(12): 3398–3402. 4 view, 2 view and Quick Screen, Seated Assessments, Anywhere and Anytime and always in palm of your hand with PostureScreen! 4 view, 2 view and and Seated Assessments with SitScreen module can be used with the comparitive report module to better objectively guage a client’s response to your intervention. Easily link your WebExercises account to PostureScreen to assist in prescribing your corrective exercise programs. Please note that not all features are avaliable for Android platform at this time for details on both iOS and Android modules and more details on pricing and subscriptions, click here. [Conclusion] The posture mobile application has demonstrated strong rater reliability and preliminary evidence of construct validity. This application may have utility in clinical and research settings. J Phys Ther Sci. 2018 Jan; 30(1): 31–36. Select from any prior postural assessment to do side by side comparisions in order to track changes in your client’s posture. All joint angles and linear displacements including predicted head weight forces are compared. Comparison reports are generated in PDF format as well as seperate annotated jpg images for uploading to electronic health records and client management systems. The Posture Trend Analysis is a great objective quantitative document to track a client’s long term postural assessments to guage trends and changes over time. Compare up to six posture assessments over time. A trend analysis is generated as a PDF document as well as annotated side by side jpg image for uploading to electronic health records and client management systems. Any SquatScreen or Push-Up/Plank Screen can be compared to generate objective documentation in PDF format that can be shared with electronic health records or client management software. Videos can also be displayed with side by side comparisions to better demonstrate qualitative movement changes in functional screen allowing for better care and client education. [Clinical Significance] Work-related MSP (WRMSP) is a significant health problem among dentists and may be linked to the later development of vertebral deviations. PostureScreen analysis is a quick, yet objective postural and movement screening tool in which findings can quickly be rendered to prospective dentists, so that custom postural and functional exercises may be correctly practiced. Integration with the WebExercises iOS platform to allow custom exercise content for easy exercise prescription to your patient or client. A WebExercises account is required for all exercise content integration. Save time by using the “suggested exercise” libraries that correspond to possible correctives based on specific movement screen findings or postural faults. Exclusive integration with evidence based corrective postural exercises from Clinical BioMechanics of Posture a.k.a Chiropractic BioPhysics Technique. DISCUSSION: Dental occlusion anomalies and posture pathological modifications can be inter -related. PostureScreen® Mobile app might represent a useful tool in the early diagnosis of dental occlusion pathology. Upgradable to LeanScreen and SquatScreen! **Please note that not all features are avaliable for Android platform at this time.